I told y'all that I have been making a few changes to the master bedroom and was looking for something to hang above the bed. Well, I found it. I had actually left it at the antique mall the first time and went back a few days later and figured if it was still there it was meant to be. Here it is in the sunroom in its original state. I wasn't sure I wanted another mirror, but love the style of this piece. A closer look at the details you can see this is solid wood. The finish is so close to the color of my bedroom walls that I thought I would paint it. I painted it with Shutter Gray MMS milk paint and hung it on the wall and it was too blue. So back down it came. I grabbed a wet cloth and started wiping most of the paint back off and then it was perfect. I love how the paint is just left in the crevices. Here is a side by side so you can really see the difference. Hopefully the room reveal will be soon. So hard to get good light in my room this time of year. I hit the outlet mall today and found some really good deals. Hope your extended holiday weekend is going well. OMG I want that mirror so much I can practically see it in a space that needs exactly that. I love it, I adore it, I covet it, be still my heart. That is the greatest mirror! Beautiful mirror, Kim. I love the detailing on it and how the blue stayed inside it. I'm sure it will look great above your bed. It's gorgeous! :) It's an awesome find. Can't wait to see the room reveal! Really pretty! Nice paint job too!! Oh I love how unique it is - I'd love to find something similar for above our bed! Inspired. Love it, Kim, especially with the paint that you added. It will look fabulous in your bedroom! Oh, my goodness, this is gorgeous, Kimmie! It's gonna look so beautiful in your bedroom. Happy Memorial Day! That's a really beautiful mirror, Kim. It's going to look gorgeous in your room. I go by that theory too ~ if I see something I like and it's still there the next time then it's meant to be mine! Luvly mirror Kim. I know the full reveal will be stunning. Oh I love this piece Kim..it is going to look awesome above your bed! wow, what a fabulous piece, great score, love the new paint finish!! Kim, glad it was waiting for you. Love the lines! Kim I love it! It is perfect for that spot! Beautiful mirror for over your bed. Love it!! Kim, your mirror is just beautiful! I love the intricate shape. Beautiful piece and I love the after picture. Great job...Kim. Happy Memorial Day. That is a great looking mirrow Kim! Can't wait to see it in your room. Can't wait to see it in place. I love it! That mirror is really pretty and I like the finish you gave it. Looking forward to seeing the other changes! It is a beautiful mirror Kim, I love the finish! Please enter my Giveaway from Segreto Finishes! Love the mirror even more with its new paint highlights. Yes, if it's still there, it's meant to be. Great choice, Kim. Your extra touches always take pieces to the next level. That's going to look great above your bed. Can't wait to see it hanging. Much better with the paint on it. You do such a great job with your finishes. Gorgeous mirror Kim, it will work anywhere in your home. I love the the new finish, old look. You sure know how to work with paint! I told you on Facebook that this is beautiful. I can't wait to see it in your bedroom. You found quite a beauty. Yay Kim! That's a great find and your paint treatment is perfect. Can't wait to see it in your room! Wow...great mirror...I wish I would found it! 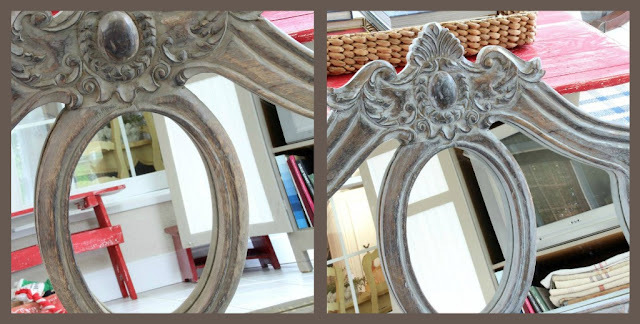 I think that mirror is perfect for the area above your bed...and you can really see the detail so beautifully once you applied that great paint treatment...you really scored on that piece..Can't wait to see it in the room! I love treasures like these, I also love how the paint turned out!! It is beautiful! I've enjoyed looking through your blog. Check out Sunshine PenPals and join the fun, we'd love to have you!